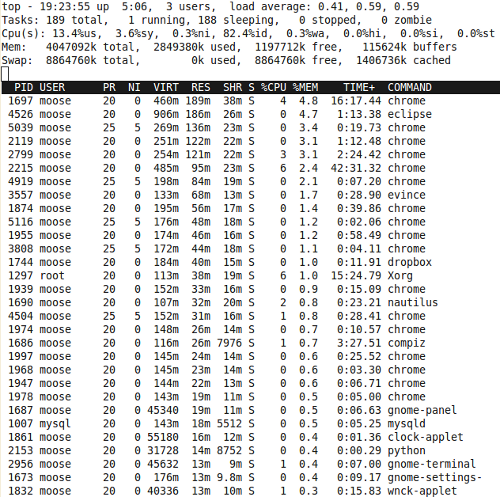 I've you want to check your memory consumption on a Linux machine, you can use free. This means: I have a total of 3952 MB RAM, used and free should be clear, shared is memory which is shared between processes, e.g. shared libraries. The "buffers" entry tells you how much of your RAM is being used for disk buffering. Over 8 GB got swapped out. pmap reports a memory map of a process. Lets make an example. Eclipse has the process ID (pid) 4526 at the moment. So at the moment eclipse is using 927MB of virtual memory. But it need "only" about 186 MB real, physical memory. According to virtualthreads.blogspot.com all data segments have the access rights rw--- and all code segments have the rights r-x--.